If your floss smells after flossing then you must know that people that you have been talking to that day have been smelling that same awful smell as well. It’s also likely that your tongue has the same terrifying odour. I know this because the first time I scraped my tongue I decided to smell it (big mistake), faeces come to mind. 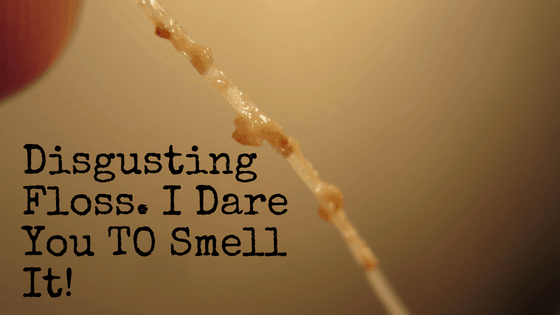 So I do know what you are going through and there could be a couple of different reasons you are constantly being exposed to this smell when you are flossing. So please pay attention and read on to potentially find a fix for this problem. Why Does Breath Smell Bad In The First Place? Don’t feel isolated because this problem is more common than you think. About 50% of the general population encounter this problem. Out of the 50%, 90% is because of the oral cavity, 9% is due to other non oral reasons such as gastrointestinal system, urinary system or respiratory. The other 1% is due to drugs and diet. There’s not much information on these bacteria apart from a few studies looking at their structure. Here are the important things: It is a gram negative, anaerobic bacteria that is motile and looks slightly like a centipede in its shape hence why its called that. It produces hydrogen sulphur compounds which gives off a rotten egg smell. This is another bacteria which harms not only your teeth and gums but also creates an environment were bad smells can flourish. It is a gram negative, rod shaped, anaerobic disease causing bacteria. These bacteria release methyl mercaptan which smells like rotting cabbage. I don’t know about you but mixing rotting eggs with rotting cabbage is not a good idea at all. And not to mention the other compounds above, imagine the kind of smell they produce. I would not be surprised at all if you mixed everything together and it smelled like poo or a rotting corpse. Is It Normal For Floss To Smell? It is quite common for floss to smell after you have scraped away the dirt from in between the teeth. Having a bad odour on your floss does not necessarily mean you have a bad breath condition, but is also not a good thing to have an odour on your floss after flossing. There are a few reasons why someone might have a bad odour on their floss. Anaerobic bacteria are the main offenders that cause gum disease and they are often found living under the gums where they release their awful smells via sulphur compounds (VSC) mentioned above. The sulphur compounds produced by these bacteria are the same ones produced by bacteria that cause halitosis so its quite easy to see how odours found on one’s floss can be misinterpreted as being related to a halitosis condition. Having odours on the floss is not a good thing because it means the bacterial activity under the gum tissues is increasing, and of course this can lead to gum disease. Regular twice a day flossing will help with this. The reason the floss smells [after you use it] is because that area is hard to reach and the bacteria is aged. Flossing allows you to go up to two millimeters under the gum tissue to reach where bacteria are colonising, when you floss you are always going to be catching bacteria and this is why your floss will smell most of the time. Good oral hygiene is important for oral caused halitosis. Proper brushing is the first step, get this wrong and you are already in a losing battle. It’s about technique, the duration and being gentle. 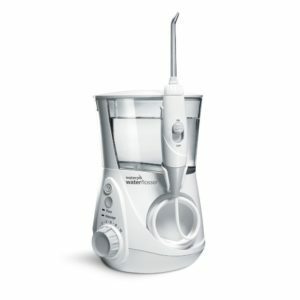 If you use a manual toothbrush then this can be quite tricky and a lot of people get it wrong, that’s why we suggest getting an electric toothbrush because technique and timers are already built into them making it much easier but more importantly more efficient. A study carried out showed that electric toothbrushes removed 11% more plaque than normal manual toothbrushes. Floss is best friends with toothbrush. One cannot function without the other. Tooth brushing will only reach the front and back of the teeth but did you know the major problems come from in between teeth. Bacteria love hiding in these spaces and creating plaque. If you don’t clean these spaces then guess what? bacteria will keep multiplying and releasing VSC’s leaving your breath in state of despair. Floss at least 2 times per day before you brush and if you can try increasing this overtime to 3-4 times per day after each meal. This way you will stop bacteria feeding on any food debris left behind and this in turn will reduce bad breath. Is There Anything Else I Can Use To Floss? Clinical trials have resulted in significant improvements in oral health when using the waterpik, including a 93% improvement in reducing bleeding and up to 52% better at reducing gingivitis than traditional dental floss. There will always be arguments for and against flossing be that with string or water. Evidence will favour both sides and there will always be the dramatic headlines that say you need to or don’t need to bother flossing. Make your own judgement call, but if you ask me it is better to floss. Those who do floss suffer less with gum problems. Sometimes even if the periodontal health is perfect, tongue coating can be an important source of bad breath. Many journals have been written discussing the part the tongue plays in obtaining a healthier fresh mouth. The statistics above conclude that in 68% of cases, deep cleaning of the tongue should have a major affect or even cure persons bad breath. One of the studies showed the importance of tongue cleaning; reduction of VSC levels was found with the toothbrush 33%, with the tongue scraper 40%, and with the tongue cleaner 42%. Some Other Conditions that could be an underlying condition to your persistent bad breath. This is basically known as dry mouth which results in reduced salivary flow. Its not classed as a disease but it can lead to other medical complications, one of the main ones being gum disease and its related problems. The saliva is critical in keeping a good environment in the mouth. It possesses many important functions including antimicrobial activity, mechanical cleansing action, control of pH, removal of food debris from the oral cavity, lubrication of the oral cavity, remineralization and maintaining the integrity of the oral mucosa. You need to go see a doctor and understand what is causing this problem. Mouth ulcers occur on the lips, tongue or the inside of the cheek. They look swollen and are usually white or yellow. It is quite normal for more than 1 mouth ulcer to be apparent at any given time and could spread or grow. aphthous ulcers stink up your mouth. This is because the bacteria that are attacking your gums, tongue or inner cheeks are also pumping out bad-smelling compounds as a byproduct of their digestion. If you are constantly getting mouth ulcers then this could the main reason why your bad breath is not going away. Usually ulcers disappear on their own within 10 days but if your someone who keeps getting them constantly then it is a sign of infection and will need checking out. Diseases, such as some cancers, and conditions such as metabolic disorders, can cause a distinctive breath odour as a result of chemicals they produce. 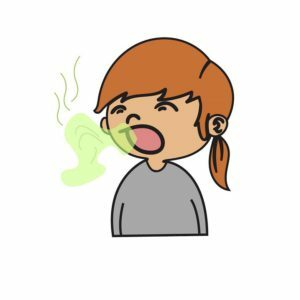 Chronic reflux of stomach acids (gastroesophageal reflux disease, or GERD) can be associated with bad breath. It is really important that if your bad breath is not going away even if your oral hygiene routine is top-notch, you need to see a doctor immediately. There is an underlying cause for sure! 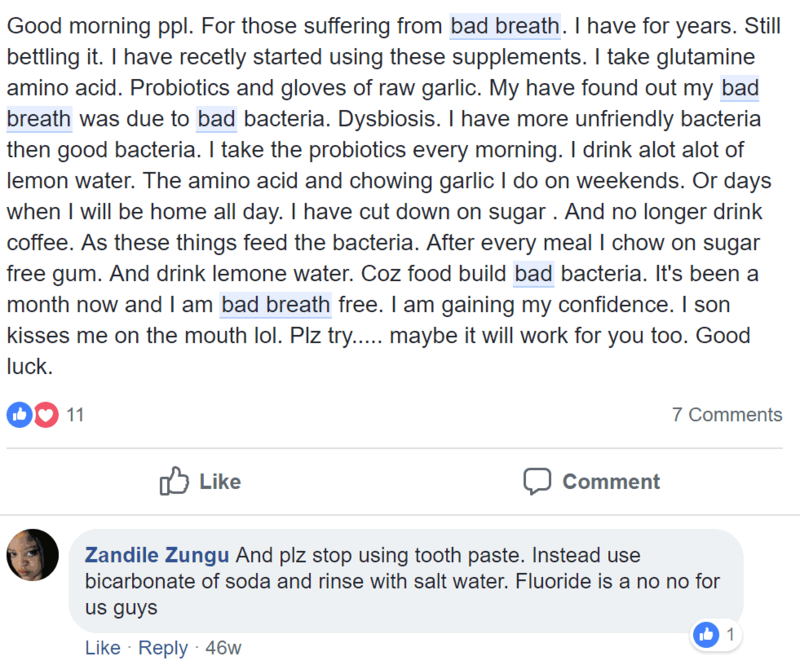 Here is someone who tried a natural treatment to help her get rid of bad breath. Please read it and see what you think. You can even try it yourself and see how you feel, you might also get cured! So there you have it, Floss smells after flossing because you are digging up the bacteria that had made the gum tissue their home. These bacteria release sulphur compounds so when you smell bad odour it means you have got rid of some of these disease causing bacteria but it also means your oral hygiene is not that great. The basics need to be carried out daily without fail if you want to ever have a life where your breath does not stink. Although if you are already spot on with your daily cleaning then you know it is some other problem/disease that might be causing halitosis. In this case you need to go see a doctor and get to the bottom of it sooner rather than later. We value your opinion and ask you to please comment about your experience with flossing and bad breath. Are you currently struggling or have you finally cured your problem. We want to know how you did it because it could also help someone else. Thanks for giving advice about cleaning our teeth. Mine are slowly going yellow and I have been brushing my teeth manually with baking soda and lemon juice. I know how to brush my teeth very well until I cannot feel any plaque on them with my tongue. My tongue however is coated so I believe oil pulling and also brushing my tongue or tongue scraping is in order. This could be due to undigested fats I think – correct me if I am wrong.. Please write more about oil pulling – it is a very interesting subject, don’t you think? you say your teeth are going yellow, how often are you brushing with baking soda and lemon juice. Please dont say everyday. Lemon juice is very acidic and if over used can cause enamel to wear away. This could be a reason for your yellow teeth. Your diet is another factor which might be causing teeth to turn yellow. As for your tongue, i suggest getting a tongue scraper and use it everyday to see if it clears up. If it’s persistent you will want to get it checked out by a doctor/dentist, there could be an underlying problem. I will be publishing some more articles on oil pulling, just trying to gather the scientific evidence at the moment. Ok Teeth Man, I soooooo wasn’t ready for this. However once I got pass that first pic, I realized this is exactly what people need to see, maybe not so much me on that first pic. That being said. Oral hygiene is major. I didn’t know some of this information about flossing and I am a teeth junkie. Flossing is one of those things people just tend to forget. Only thinking about brushing is not going to be enough for you to keep your teeth in tip top condition. Cleaning the gunk from in between teeth is vital to controlling plaque and keeping it at low levels. LOL the first pic is a bit of a doozy. I left a comment on your site.